Nicht lagernde Farben - Lieferzeit bis zu vier Wochen! The Thumbport guides one's right thumb to support the flute at an angle (see A in Ill. 3). The force (A) created by this angle can be seen as the sum of two partial vectors: one supports the flute from below and the other counters the horizontal rotation. 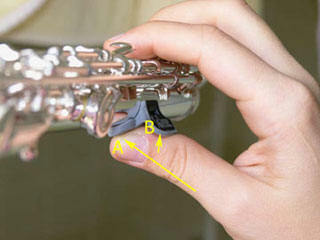 The extension arm rests on the thumb gently (see B), which easily prevents the flute from rolling backwards.